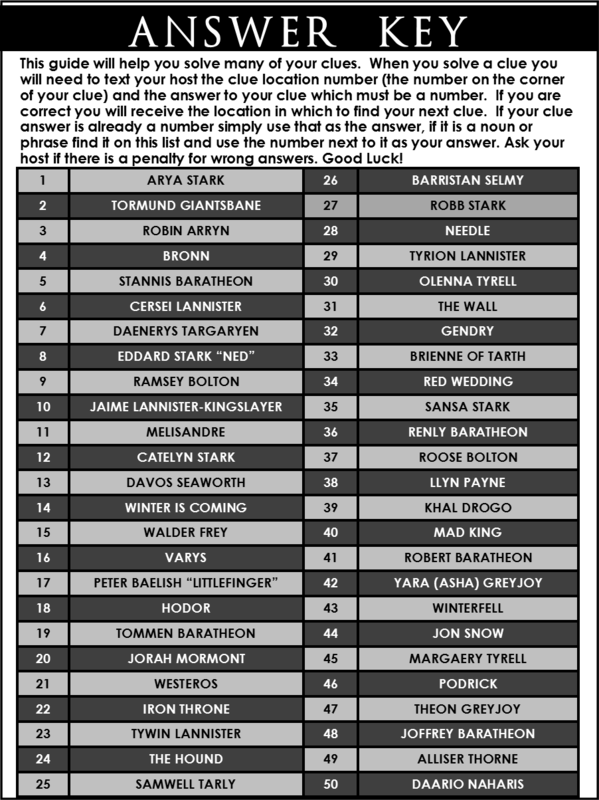 Our Game of Thrones trivia treasure hunt is not for the faint at heart... it is a true fandom game where you get to put all your knowledge of the Westeros and it's inhabitants to the test! 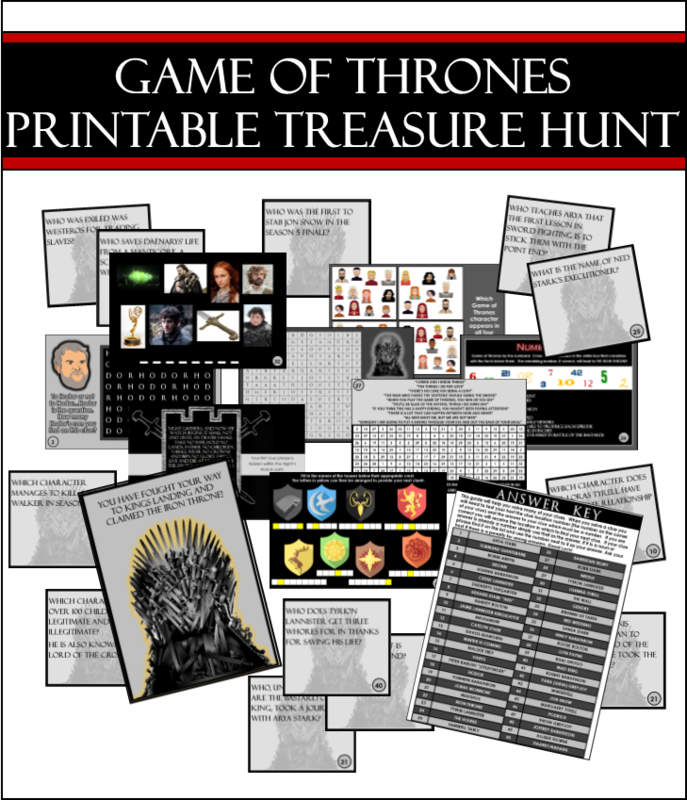 This printable treasure hunt includes a variety of clues made up of trivia, puzzles, and games. Each clue leads to the next until all 20 are solved and players find the "treasure" or "die" trying. The treasure can be whatever you want it to be, or just bragging rights. This hunt is perfect for a theme party or just true fans. It will be the highlight of the party! In the Game of Thrones you either win...or die! One of the most awesome things about this treasure hunt is that it can be played anywhere because YOU CHOOSE THE HIDING LOCATIONS. You hide the clues in whatever your playing area provides. Sometimes this is just an around the house game, others make it an around the town hunt where players must drive from one location to the next. It's up to you and either way we have you covered. You choose the hiding locations and record them on your host guide. Players are divided into teams and given the first clue. When they solve it they text you the answer number and if correct you will text them back the next clue location. We provide 20 clues, but you can use as many or as few of those as you want. 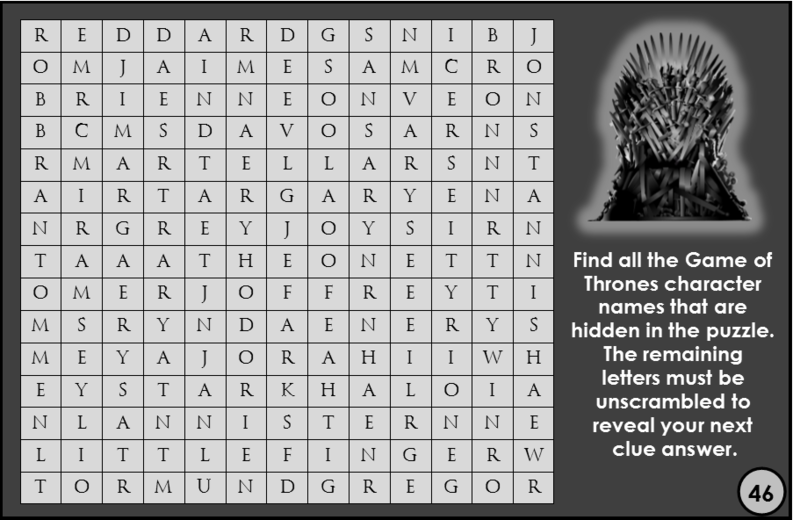 The team that solves all their clues the fastest with the fewest wrong answers wins the Iron Throne and the game! Teams will also be given an Answer Key at the beginning of the hunt that they will use to help solve clues. Since each clue answer is a number this key will also give players the correct number to certain answers. 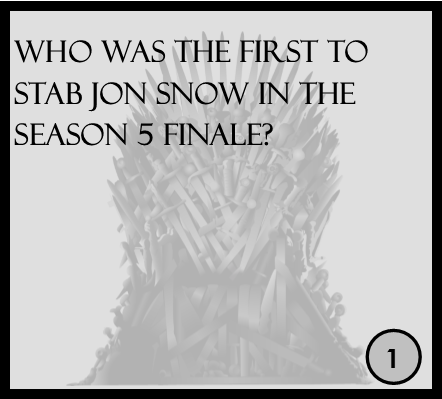 For example if the answer to the question is Jon Snow, players would find Jon Snow's name of the Answer Key and text in the number located next to his name to receive the next clue location. Another example of a time when players would utilize there Answer Key is the puzzle below. 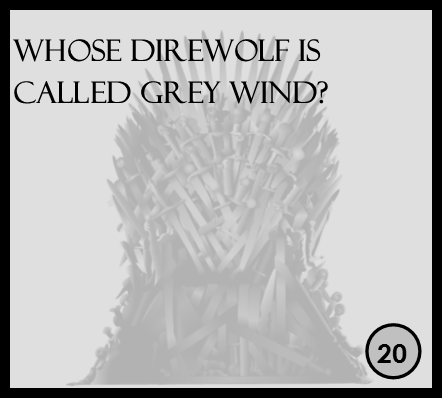 It has a list of many Game of Throne quotes and players must determine who said each one. For each quote they will find the character that said it on their answer key and fill in all the numbers on the grid that matches that character. 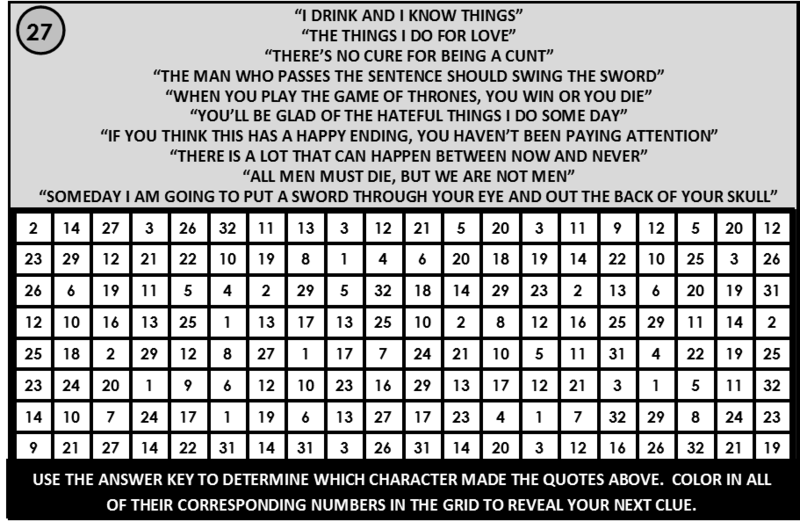 So if they believe the quote was made by Sansa Stark then they would color in all the 35's found on the grid. Once you do this with all the quotes then a word will be formed on the grid. Players will then find that word on the answer key and text in the number located next to it. They will be texted back the next location to find a clue. When you and your friends need a GoT fix and you don't have time to rewatch every episode AGAIN. 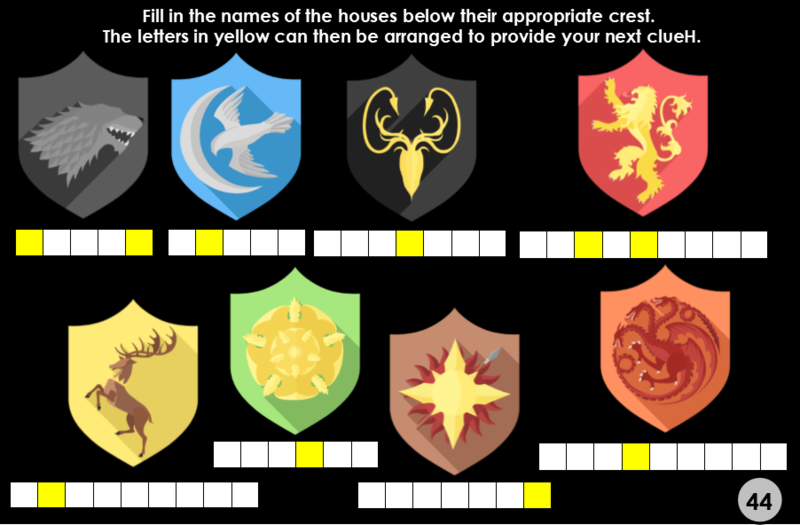 get your game of thrones trivia hunt now!